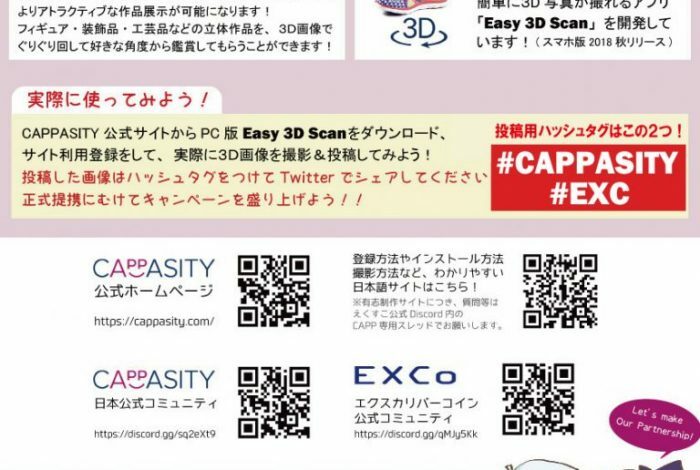 EXCo will implement “CAPPASITY x EXCo MAKE PARTNERSHIP Campaign” as a joint promotion with CAPPASITY Japan Management Team! CAPPASITY is an overseas company established in 2013 with the aim of developing 3D and AR / VR platform. We are developing “easy 3D scan” application which makes it easy for anyone to create 3D images. By using CAPPASITY ‘s “easy 3D scan” and publishing the generated images on Arther, it becomes possible to exhibit 3D works more attractive and more realistically online. This is a big step for Arther to achieve the all-genre platform! Toward an official partnership, I will show you the size and possibilities of this community, which excites easy 3D scan with the Eekuku community by all means. Please pass this campaign to success by all means of everyone!